Sales leaders seem to be ignoring some very obvious trends that are now occurring in the business world. When it comes to operating a B2B sales force, you could be forgiven for thinking that sales leaders have all gone mad? Or are they simply too busy to see what’s happening around them? Average sales cycle times are increasing – it’s universally accepted that sales cycles are now getting longer with ‘consensus buying’ being the new norm. That is, 6.8 buyers for each purchase decision (CEB), and more scrutiny from procurement departments on every deal. Agreed! Tenure – “The average tenure of a B2B sales person is 1.4 years (or 16.8 months), while less than 5% of sales people stay on board for more than 3 years” (Sales Metrics Report 2016). Yep, sounds about right to me! On-boarding – ‘sales ramp-up’ (that is, ‘time to bring a new hire to full productivity’) is now much longer than ever before and this is an indictment on sales leaders. According to a recent study by CSO Insights 60.7% of the study participants reported a ramp-up time of seven months or more. 18.1% stating the ramp-up time is 1 year. What the? OK, so let’s just pause and attempt to make sense of some of these above-mentioned trends: so, more stakeholders and longer sales cycles – with averages (specifically in B2B technology sectors) said to be ranging from 6-12 months. And the average sales person only lasts about 16 months in their role which means that in many cases they barely get enough time for 2 – 3 sales cycles. But hang on – according to CSO Insights, it’s taking 60.7% of these same sales people more than 7 months to ramp up to full productivity. Therefore, the majority of sales people have about 11 months of effective selling time before they are off to their next job. What the? If this scenario sounds about right for your business then one can only conclude that your sales leader (and possibly your HR Manager) has gone mad. Seriously, against this backdrop, is it really any great surprise that business leaders are having such a hard time building sustainability and predictability into their businesses? Are you surprised at the declining returns from your investment in the sales function? No surprise that almost every sales leader that I know is now complaining about: declining conversion rates, dwindling pipeline and horrendous staff attrition (among other things). In the past, a vendor sales person offered value to buyers through the process of sharing information that would help solve the buyer’s problem and also result in a sale for the vendor. This was information that buyers did not possess. Search engines (Google) and social media has reversed that dynamic by providing buyers with access to all of the information that they could ever require to solve their own problems without needing to speak to the once all-knowing sales person. We now operate in a globalized world where mature markets mean educated buyers and commodification of products. Barriers to entry are low, with increased global competition resulting in downward pressure on pricing and margins. The increasing speed of innovation also means that product life-cycles are getting shorter and shorter. Business velocity is at unprecedented levels. Today, if sales people are not seen as “adding value” — that is, being a source of specialist (not general) knowledge about how buyers can tackle a problem, or examples of how other customers have realized value — then the likelihood of securing appointments with prospective buyers is zero when buyers are already time poor. Buyers are desperately looking for any means by which to drive costs down, and most businesses are now trying to rationalize vendors. That means doing “more business with less vendors”. As a result, there are very few wide open ‘greenfield’ markets….on the contrary, if you are not an existing supplier then your ability to attain net new customers is increasingly limited….even your existing customers would like to find a way to cull you. Buyers now complete between 60-80% of the buying journey before talking with a vendor sales person. Customers are educated and self-directed and are looking to self-serve wherever possible – actively avoiding talking with a biased sales person, whom they know, has a vested interest in recommending a course of action that also benefits them. These 5 x trends or concepts are no doubt contributing to the increasingly long sales cycles, high levels of sales staff attrition, and the increasing % or sales people that are NOT meeting quota. If your sales leader is ignoring these trends, or simply too busy to actually zoom out and see what’s going on, you had better call ‘time-out’ and reassess your go-to-market approach. By the way, I am by no means a blind follower of statistics. As Mark Twain said, there are three kinds of lies: lies, damned lies and statistics. However, these above-mentioned stats and trends are almost 100% congruent with my own recent experience working with B2B sales departments, and I’m not trying to argue any particular point here. I’m yet again simply attempting to shine a light on some of the madness that exists in the sales space right now. Of one thing I’m certain, if your sales leader is running the same old approach to sales in this modern business context then you might want to check his/her mental state. 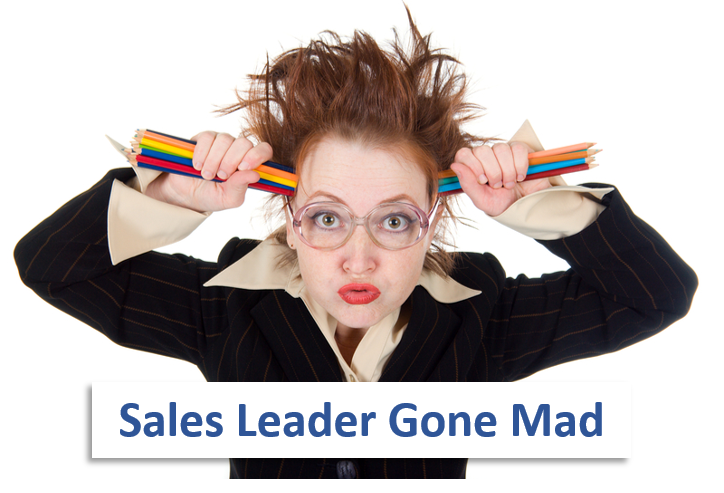 Has your sales leader gone mad? I would love to hear your thoughts on this topic. Please let me know if you agree or disagree? Please follow my LinkedIn post page for all my articles.